SCVHistory.com JD7201 | Acton | Shootout at Darcy's Acton '49er Saloon. Antelope Valley Press, 12-5-1972. Five were injured and 11 arrested when the Vagos biker gang decided to retaliate against Acton gas station owner Tommy Driscoll, who didn't like bikers and had refused to sell them gas earlier in the day on Dec. 2, 1972. They caught up with him that night at Darcy's '49er saloon on Crown Valley Road. No one was killed, but business pretty much died after that at the restaurant-bar, which was owned at the time by Curtis and Jo Anne Darcy, who would become mayor of Santa Clarita about two decades later. 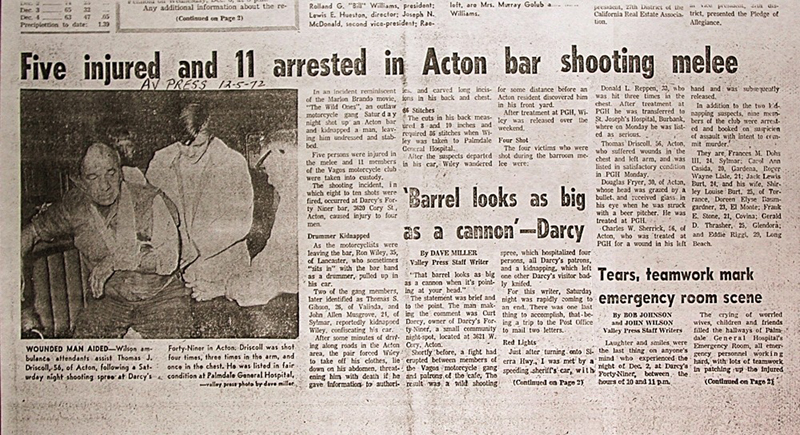 After reading the account of the "Shootout at Darcy's" [in The Acton Rooster], I began to wonder if the article and the narrator had really experienced the same incident in the same cafe that my husband owned from 1968 to 1974, because the facts presented were so divergent from the actual chain of events that occurred that infamous evening on December 2nd. I thought I was reading about another time and certainly about another place. And although I never wanted to dredge forth this incident again because it was so terribly painful to the victims and participants, I guess it has been forced to the forefront anyway by Tom Driscoll. Therefore, I will attempt to present another, more accurate viewpoint of what actually happened on that fateful evening. My facts will be presented directly from the documented statements taken by the court reporter after the event and by our insurance agent who carefully prepared interviews from actual witnesses within a week after the event There were over 60 interviews involved. Excluding several name misspellings, I will begin by saying that the Dec. 2nd event happened on a Saturday night, not on a "Sunday in the peaceful, little town of Acton." The referred to "outlaw motor cyclists" were members of the Vago Motor Cycle Club, and perhaps not established "outlaws" as indicated. They did not "throw pool balls around the room," although I admit it makes for a much more colorful story. If they had, my husband, Curt Darcy, would have ordered them to cease and desist. They did accidentally break a small bathroom mirror, but that inadvertent action did not warrant removal by the sheriffs. Mr. Driscoll was in the cafe much longer than the time it took to prepare a few hamburgers to go, and when it was later discovered that be was carrying an antique gun on his person, owner Darcy asked him to remove it to the locked section of his truck glove compartment and not bring it back into the cafe. Driscoll complied and returned to converse with patrons of the cafe until about 3 p.m.
Driscoll returned about 8:30 p.m., sat down at the bar, ordered his usual Coors beer, and began to converse with patrons on either side of him. During this time, several bikers came up to him and chatted. At 9 p.m., I proceeded to close and clean my restaurant grill and heard loud conversation behind me. At this time, my husband and two waitresses were serving customers within the building. I turned to look and saw Don Reppen being hit on the back of the head with a glass beer pitcher by a biker. Reppen did not drop to the floor but started to fist fight with two of the nearby bikers. Within a few seconds, I heard Driscoll yell, "Hey, what do you think you are doing?" He then appeared to reach beneath his belt, and a shot was fired from his direction. He later told the sheriff that his gun had been taken from him by "gang members." Almost simultaneously, my husband ran for the phone behind the bar near the cash register and freezer, and one of my waitresses ran out the back door to call for help at the nearby grocery store. After that first shot, "all hell" literally broke loose and several shots followed. My husband next heard the whizzing sound of a flying bullet directly by his left ear when he attempted to phone for help. I yelled at him to get down, because so many bullets were being fired, I feared he would be hit. During this time I ran to the center of the melee and assisted my patrons out the back door while Liz Dishon assisted the wounded with towels and later blankets taken from our home directly in front of the cafe. As I was literally pushing the spellbound and fear-struck patrons out of the building, I saw Chuck Sherrick hit in the hand with a bullet that had ricocheted from an overhead beam, and I saw Mr. Reppen slump to the floor after being hit several times by assailants Gibson and Musgrove. We learned later that Driscoll was shot by his own gun, which had been wrestled from him during the beginning of the melee. Several guns and knives did appear after the fracas began, but they were not visible before the incident. The sheriffs later told us that female companions of the bikers usually carried their boyfriends' weapons because they could not be searched by male sheriffs. In the exiting flurry, I asked Dana Sherrick to use our front pay phone to call for help because my waitress, Lee, had not returned, and the rest of us were detained at gunpoint from using the phone or leaving the building. It was later learned that Dana had been ordered at gunpoint to stop his call, and the pay phone was yanked from the wall by a biker. My son, Darrell, had also seen the fighting from a distance outside [and] had run inside our home and called for help. This was duly noted and recorded by the Palmdale Sheriff's office, but it still took them almost 45 minutes to respond. After the patrons and bikers left, only Gibson, Musgrove, my husband and I remained standing. Liz Dishon was still on the floor near Reppen, applying pressure to Reppen's bleeding wounds. The gunmen ordered me to move up to the front door next to my husband, who was being held at gunpoint by Gibson with the gun pointed directly at his temple. At the same time, my eyes were fixed on the barrel of Musgrove's gun, and I was thinking inwardly that this was it — the end of the line for both of us. The two remaining gunmen were actually in a state of panic as their fellow Vago members had left them alone without transportation. Just about then, two headlights appeared outside as the unsuspecting Ron Wiley, a part-time drummer friend of ours, approached the parking lot in his car. Gibson twitched and told Musgrove to "watch 'em" (meaning Curt and I) and left to stop the approaching car. Minutes later, we heard the car horn, and Musgrove tensed and raised his gun to the direction of Darcy's temple. I truly believed we were finished and figured one last statement wouldn't make it any worse, so I looked directly at Musgrove and said, "We haven't hurt you — why do you want to kill us?" As if by a miracle from above, Musgrove lowered his gun and walked out the glass doors to join Gibson and Wiley in the car. Thank you, Lord! However, not so lucky was Ron Wiley, who not only had been kidnapped at gunpoint, [but also] later robbed and so badly knifed that it required 86 stitches to close the X-shaped wounds. He was left almost naked on [a] freezing night on an abandoned road near Acton, it was later reported by Wiley. I know that my rendition of this incident will probably be disputed as Driscoll's was, but one must take into consideration that violence exists in the eye of the beholder (or victim, as it applies in this case), and what happened at one end of the building does not always correlate to witness' testimony at the opposite end of the building. I am grateful that no one was killed; that more people were not injured; and that we had the wonderful Acton people helping us through this terrible event. My undying thanks shall always go to Liz Dishon, Don Reppen, Lee Wise, Wanda and Bill Jameson, Fred Tortell, my husband Curt, Ron Wiley and my son Darrell, because I believe they were the real heroes in the heinous episode. And also, to set the record straight, I had asked Leo Reilly to call the sheriff immediately when the bikers arrived earlier in the day in such a large group (38 or more). He did so, and when the sheriff's cars (2) arrived some 20 minutes later, there was no incident I could name that would have warranted making a complaint charge stick. And the sheriff (one car) did remain in the parking lot for over 40 minutes until the group left. However, the second distress call was a different matter. Another forgotten aspect of this episode is the victims' lingering fear and recovery problems that followed, and there were many. No one realizes the horror that can follow until they've lived through such an event. And what about the gunmen attackers? They stood trial, were convicted, served their minimum sentences of three years, nine months, and actually had the gall to return to the "scene of their crime" when they were released; but this was after we had left Acton. So I was not there to witness it. What happened to justice in this case? The perpetrators went free, and the victims remained prisoners to their pain, monetary, job and business losses, and the unforgettable memory of having survived a terrible night in Acton. It surely makes one wonder what justice is, [and] why it can inadvertently serve the criminal and not the victim.